Musters Road Open Gardens donated money from last year's event to the Friends of the Green Line, which works in collaboration with the Notts Wildlife Trust. The money went towards 2 ladder boards, which give information about the Green Line, one at the Melton Rd entrance, and one by the railway bridge on Devonshire Road. 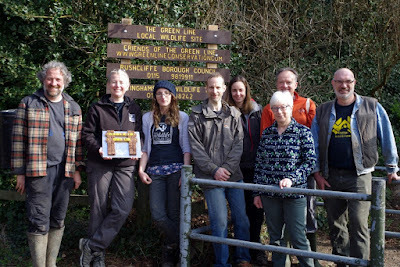 John and Carol Williams represented the open garden's team on the day the boards were put up, in March 2016.